Want to add some personalized fun to your kiddo’s next party? Then check out DIY Party Kits from Birthday Express! Each D.I.Y. kit comes with everything needed to create a fun backdrop or decoration that the kiddos will love… plus they make great photo opps! D.I.Y. Barnyard Room Decor – D.I.Y. Kit Materials – 1 Guests – YeeHaw! Spend a day down on the farm for your son or daughter’s next birthday! Make the celebration one-of-a-kind with this exclusive DIY party kit! 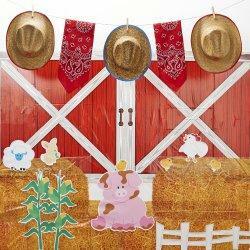 The project kit includes barn/hay backdrops, 3 straw hats, 2 bandanas, 1 set decals, and 1 roll of twine. The only things you’ll need to round up are clothes pins, tape, and scissors. D.I.Y. Superhero Comics Room Decor – D.I.Y. 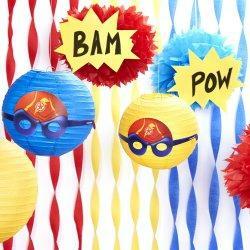 Kit Materials – 1 Guests – Create a BAM, POW, BANG, BOOM party room for your little superhero! This D.I.Y. party kit includes 2 yellow lanterns, 1 blue lantern, 2 red fluffy decorations, 1 blue fluffy decoration, 2 placemats, 2 masks, and 3 rolls of crepe (1 each of red, blue, and yellow). All you’ll need to bring it together are scissors and tape! D.I.Y. Little Spa Party Room Decor – D.I.Y. Kit Materials – 1 Guests – Transform your home into a relaxing oasis with this delightful D.I.Y. Little Spa Party project. Materials included are: a bathtub standup, 1 roll of pink tulle, 2 packs of blue fluffy decorations, and 4 packs of white balloons. 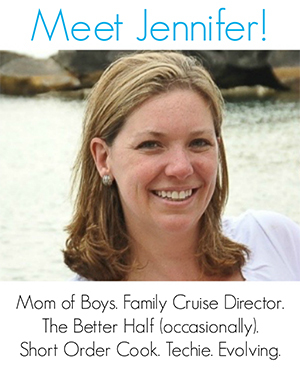 Just have some tape and scissors on hand and you’ll be able to create a special retreat for your little one. Each kit is super easy to set-up, so let your imagination run wild and create an awesome custom party room to remember! so cute! nothing like making it easy to party than having a kit to hand to help out 🙂 I love the yee haw! farm one and then after the bath….with tons of bubbles! Thanks for sharing at Snickerdoodle! I definitely that easier is better some days! Parties are fun but there’s no reason to run yourself ragged.